Derek began learning how to skate at the age of three in Cincinnati, Ohio. His Canadian grandfather, who had played many years of hockey, was his instructor and had a passion he conveyed to his grandchild. By the age of 4 Derek was hooked – he had started a lifelong love of the game and started playing hockey. Derek played Atoms and also travel before moving to Memphis, Tennessee. In Memphis, Derek played for the Memphis Blues. In 1980, Derek traveled back to his hometown and continued to play hockey in Cincinnati as well as Dayton. He finished through Midget in Dayton, Ohio and then continued to play for Midwest Hockey Express in Juniors. Derek attended and boarded at the Northwood School in the Olympic Village of Lake Placid, NY (where USA beat Russia in the 1980 Olympics – “Miracle on Ice”) to study and play hockey. He played two years of Varsity and both JV and Varsity his senior year graduating with Honors. Derek played on the JV squad because he wanted to be a Captain – one of the most important players on the team. 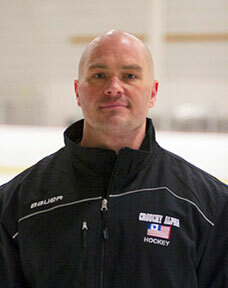 He played at Northwood from 1987-1990 with Chris Therien (Flyers) and Craig Conroy (Flames and ’06 Olympics). Northwood School has an intense focus on both academics and athletics and has graduated many hockey greats like Mike Richter who played for the NY Rangers. Derek has also played with Jason Ori (a fellow Northwood alumnae) who is the President of Chicago Young Americans. Derek continued playing hockey in college for two years at Lake Forest College from 1990-1992 and still continues to live his passion by playing in various men’s leagues in Cincinnati. Derek continues to work with athletes who have attended Schattuck-St. Mary’s, Berkshire School and Brown University as well as various others around the Tri-State area. 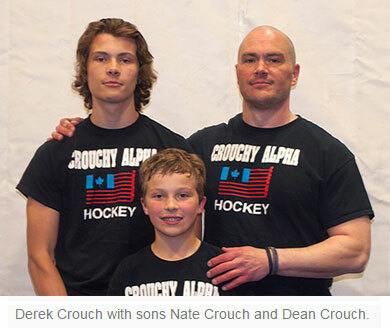 Derek’s wife Lindy is an integral part in Crouchy Alpha Hockey. She is the master organizer and scheduler for camps, ice time and lessons. Derek and Lindy have two sons that both love and play hockey at the AAA level and an awesome daughter who enjoys the hockey passion. © Copyright 2016 by Crouchy Alpha Hockey. All rights reserved.